continuing wall wednesday the snap above was taken in nyc on my street art wander with steve. if one looks closely at the red wallpaper design you will notice the word 'obey' - obey is used often in the work of shepard fairey, who incidentally has gone on to HUGE things after his emergence as a skateboarding street artist. I don't know if fairey had a hand on this wall or if someone was simply borrowing and building on fairey's recurring themes. after all, according to banksy in his recent film (see below) "there are no rules" when it comes to street art. the rat appears to be the product of someone with the tag "qrst" - of course ratty stole the mouse's heart. the film is currently showing across the country, click here to see if it's playing near you! *the film's 'official' tag line! Gotta go see that movie! The rat is by QRST, who has posted a lot of other critters around Brooklyn as well. Shepard Fairey gets a surprising amount of flack from street artists and graffiti writers who feel he sold out. Then again, so does Banksy. I guess when you're successful it's bound to generate some hostility! I have yet to be convinced that street art doesn't wilt in the light of praise. Take away its rawness and what is left? The idea of a book or a film about Banksy seems counter-intuitive : Banksy as a brand. That is quite a splendid wall. 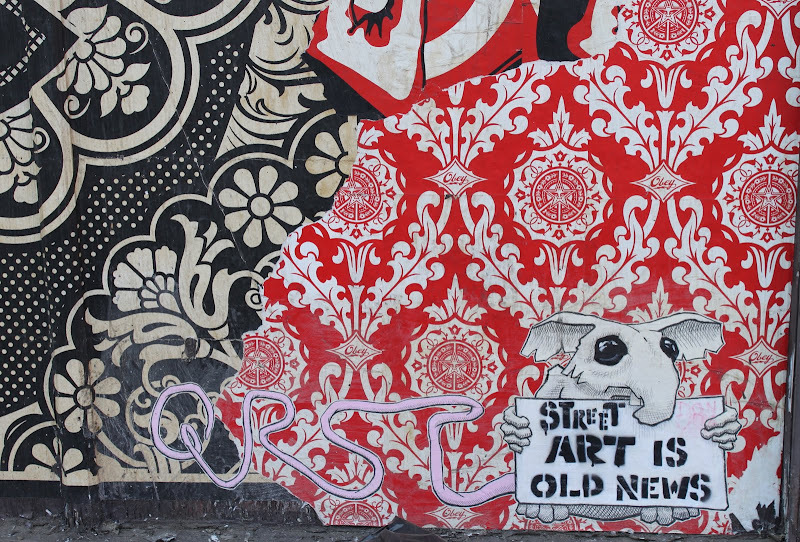 Street Art Is Theft.And all The Better Because Of It.......I hope Banksy Doesnt End Up As A Visual Mick Jagger. I'm conflicted with graffiti. I love street art and in Melbourne particularly, it's accepted and pretty wonderful but here in Sydney it just seems to be taggers writing obscenities or their tags and destroying public property. I'm not sure where the line should be drawn. Banksy of course is one out of the box and if not for his highly recognised work, good graffiti wouldn't have become the artform it is but I still hate seeing trains butchered by thrillseekers, it aint pretty not one bit.